Produced under license in 2012 by Silver Buffalo, LLC. was this Superman “It Tickles” mug. This black glazed ceramic mug was designed with the cover of Superman number 32 from 1939 where Superman is struck with electricity as he says, “It tickles!” The cover art was done by the legendary Wayne Boring. January 23, 2018 in PLATES, DINNERWARE, ETC.. 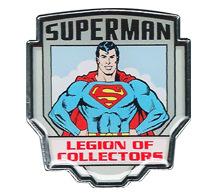 The original official Superman fan club was known as the Supermen of America and it began in 1939. By 1966, it was simply called the Superman Club. July 21, 2017 in NOVELTY.